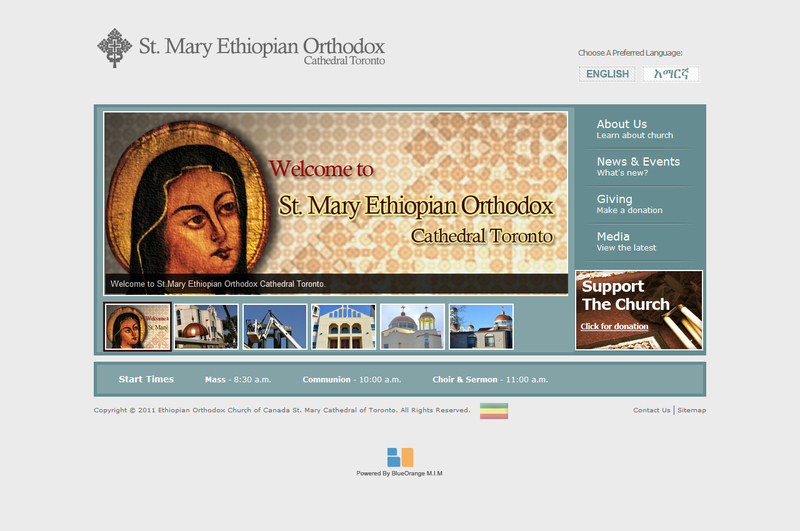 As part of the Ethiopian Orthodox Church of Canada, St. Mary Cathedral of Toronto wanted to create a distinct identity and reach out to potential new members arriving from Ethiopia. With a congregation comprising mostly immigrants over 30 years of age, the church needed an easily identifiable brand mark and a simple, easily accessible website in both English and Amharic, an Ethiopian dialect. 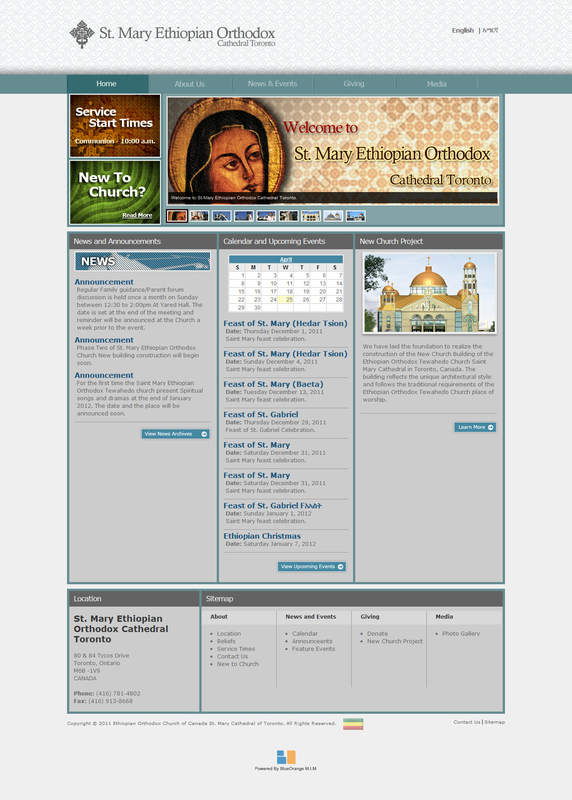 To brand St. Mary Cathedral and create a bilingual website that is at once informative and easy to use. Extensive research helped us identify the appropriate cross to use in the brand mark. (In Ethiopia, every church has its own cross.) 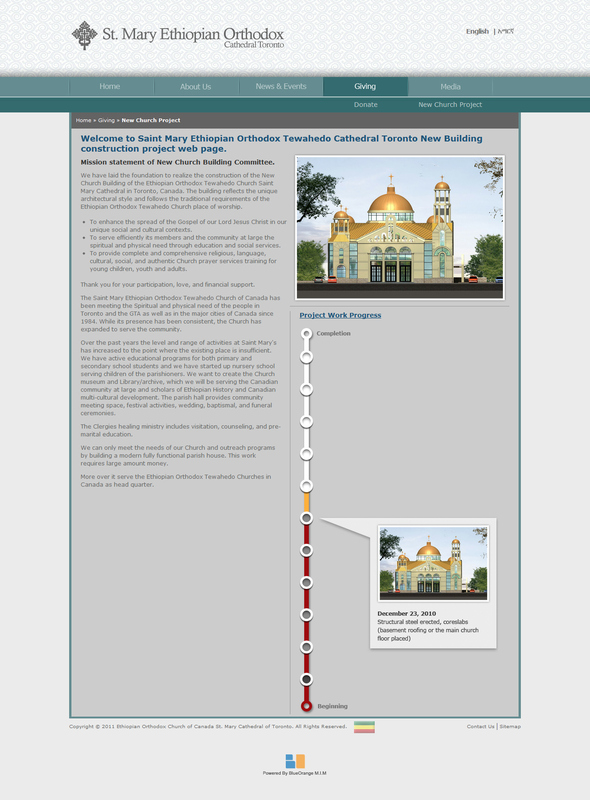 A great deal of research and thought also went into font and symbol choices to make sure that they accurately represented tTo brand St. Mary Cathedral and create a bilingual website that is at once informative and easy to use. Official St. Mary Ethiopian Orthodox Cathedral Toronto logo. This was the first time we at Blue Orange were creating a site for delivery in two languages, so content and layout also required more thought and research than usual. A simple toggle at the top of the page allows users to view the site in either English or Amharic, and a carefully crafted layout maintains the site’s aesthetic regardless of which language is being used. The simple layout also includes clear navigation and short pages, making the content easier for non-skilled users to follow and digest. Official website - New Church page.